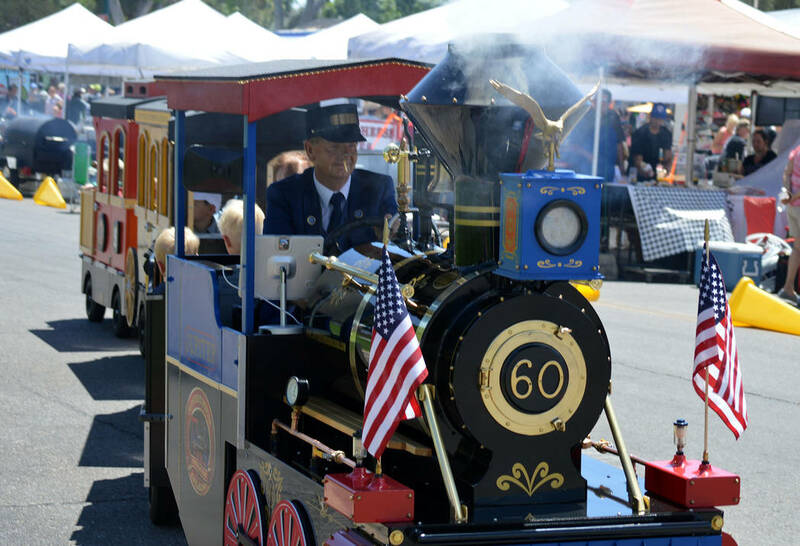 File Daryl Schelin of the Jupiter Express Railroad drove the train through 2017's Spring Jamboree in Boulder City. This year's event takes place from 9 a.m. to 5 p.m. Saturday and Sunday, May 5 and 6. 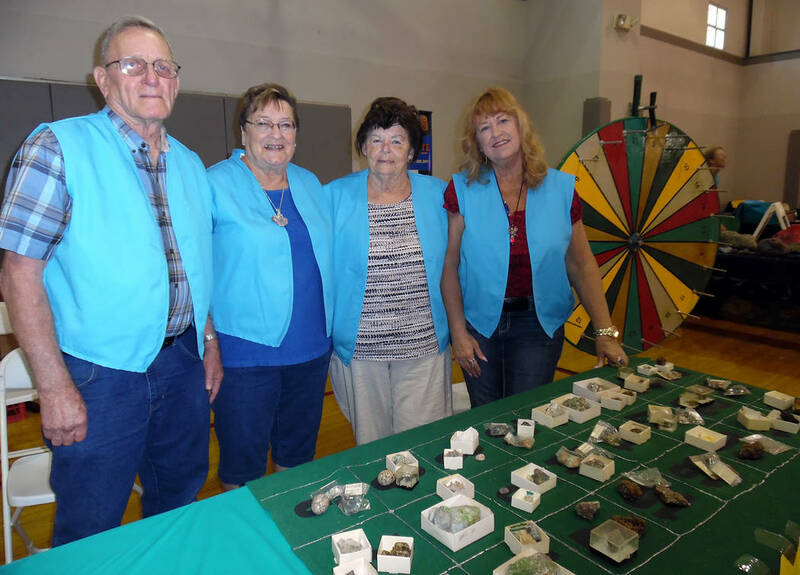 Hali Bernstein Saylor/Boulder City Review Members of the Southern Nevada Gem and Mineral Society, from left, Jerry Kuykendall, Carol Kuyendall, JoAnn Sprott and Ann Harris, had a game of chance offering a variety of rocks to the winners during the Spring Jamboree on Saturday. This year’s event is from 9 a.m. to 5 p.m. Saturday, May 5, and from 9 a.m. to 4 p.m. Sunday, May 6. It’s free and open to everyone. Among the new items at this year’s Spring Jamboree is an expanded rock and gem show, as well as more children’s activities. Rowland-Lagan said new children’s activities include a gyro ball, land balls and the Tumblebus, a mobile gym that teaches children gymnastics and fitness to help develop and improve physical fitness, coordination, balance, strength and self-esteem. The Tumblebus has monkey bars, rings, ropes, a trampoline, a slide, a balance beam and bars, a rock-climbing wall and a zip line. It is committed to safety, personal care and positive encouragement for the children who participate. Other new attractions this year include additional artists, food vendors and trucks, as well as several announcements about upcoming new events. Part of the proceeds from the event will go to the chamber’s scholarship fund for Boulder City High School. The rest of the money is earmarked for the promotion of Boulder City. The event’s ultimate goal is to help the chamber with its mission of getting people in town and through the front doors of local businesses. Now in its 41st year, the Spring Jamboree started with eight businesses. In 1977, it turned into a block party and became what Boulder City knows today as the Spring Jamboree. Since then it has grown to include many vendors and businesses from all over the Las Vegas Valley. This year, the festival will have approximately 275 vendors, which is 13 more than last year. 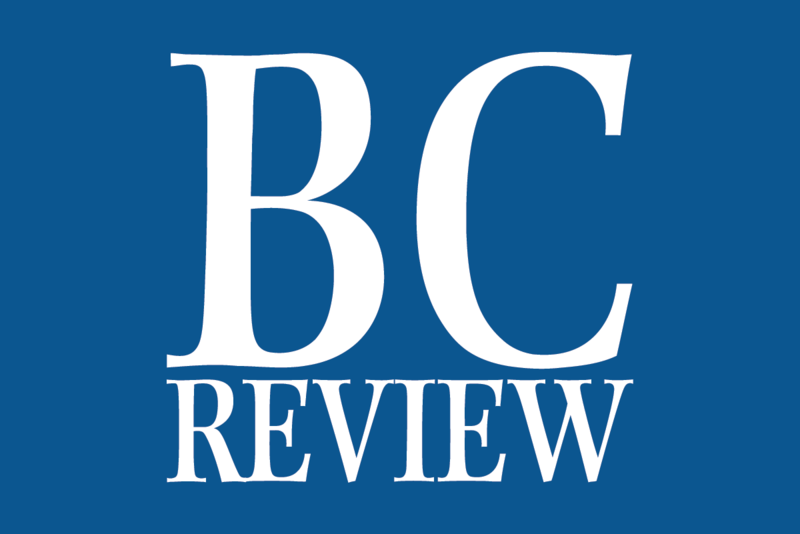 “I have quite a few applicants that have stated they are coming in … that could add to that count,” she said. Rowland-Lagan said she is expecting at least 20,000 people to come to Boulder City for the event. The 2018 Spring Jamboree is Saturday and Sunday and takes place in four downtown parks: Bicentennial, Wilbur and North and South Escalante. Ongoing events for those days include the Pan Draggers Rod Run Car Show, Antiques in the Park, an arts and crafts show, rides, face painting, tattoos, the Chamber Showcase Business Expo, the Southern Nevada Gem and Mineral Society rock show, food vendors, a climbing wall, train rides, the Bubble Fun water ride and the Human Hamster Ball. 9 a.m.: Little Miss and Little Mister Pageant sponsored by Dance Etc.